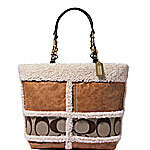 Yeah baby, a new winter bag for me! Who says it’s Christmas without buying something for yourself??? Behold, the newest “winter” addition to the BagMomma closet. « Are gift cards all that bad?